Stop press: BBC does something vaguely useful for a change documenting, in part, the bullying, threats and intimidation tactics used against the Black Irish Muslim community by MI5/MI6 and exposes the fraudulent 'research' of Reich Right Wing Stink Think Tanks. In the case of Policy Exchange, Newsnight checked the evidence and scuppered PE's pernicious plans. Edinburgh Central Mosque was one of those fingered by the [Policy Exchange] report. I said at the time that the mosque had no idea how this literature was supposed to be on their premises. A strange thing then happened a week or two later. A stash of the pamphlets in question were dropped just inside the doorway to the mosque. No one has any idea how they appeared there, as certainly none of the mosque authorities ordered them. Someone clearly outside dumped them, and they are currently investigating who that could be. Unfortunately, BBC Scotland, including Newsnight Scotland, did report Policy Exchange's "findings". People at the mosque were smelling a rat at the time, and that will now just intensify in the light of the Newsnight report. Since the advent of home-grown Islamist terrorism, Britain's intelligence services have urgently sought better information from within the UK's Muslim communities. But, as reporter Tazeen Ahmad finds out, their attempts to recruit informants are alienating many young British Muslims who say the tactics are making it more difficult to obtain the information the intelligence services seek. 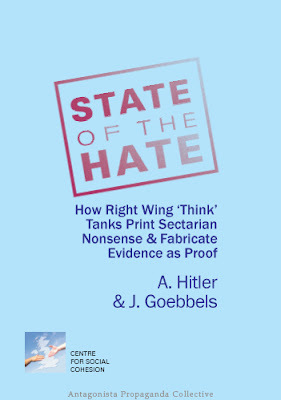 When you're done watching and listening to that little lot, you might want to cast your eyes over the latest report from the perversely named Centre for Social Cohesion, "Hate on the State: How British libraries encourage Islamic extremism". Not. On the afternoon of 7th July 2005, information came to light about a private company running a terror rehearsal operation, featuring 'mock broadcasts', in London at the same time that real explosions were reported to have occurred on the transport network. These revelations came not from an anonymous source but instead from the Managing Director of the private firm running the terror rehearsal operation. The private firm is Visor Consultants and the Managing Director in question is ex-Metropolitan Police man, Peter Power. The client for whom the terror rehearsal was being organised is, thus far, unknown. ...at half-past nine this morning we were actually running an exercise for, er, over, a company of over a thousand people in London based on simultaneous bombs going off precisely at the railway stations where it happened this morning, so I still have the hairs on the back of my neck standing upright! It is worth noting that it was two full days before the Metropolitan Police advised the world about 'almost simultaneous' explosions on the Underground, a 'fact' which they announced on 9th July 2005. 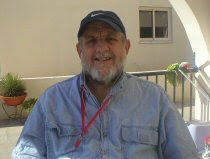 Only ex-Mossad chief, Efraim Halevi -- an old schoolboy network Clove Club chum of Lord Levy of Cashpoint, Gongs and Ks -- who wrote in the Jerusalem Post on 7th July 2005 of "the multiple, simultaneous explosions that took place today on the London transportation system" with "near pefect execution" was able to demonstrate the same level of 'insight' as Power. Halevi is now Special Advisor to private security firm, Quest, where he sits alongside the Chairman, ex-Metropolitan Police Commisioner Lord Sir John Stevens of Kirkwhelpton. Stevens also happened to oversee Operation Crevice during his watch and was the first person to announce to the world, via the News of the World on 10th July 2005, the notion of 'home grown' Islamic terrorists. Spectacular how far ahead of the game of the police all these ex-Met folk are, especially when considering the fact that, only two days earlier, Sir Ian Blair had said at a press conference, "I'm not saying there are four bombers." It's a coincidence, and it's a spooky coincidence. Our scenario was very similar - it wasn't totally identical, but it was based on bombs going off, to the time, the locations, all this sort of stuff. 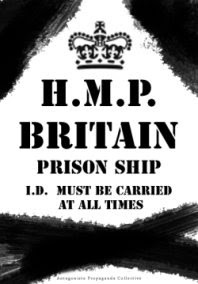 Since 7th July 2005 Power has had lots to say about a lot of things, mainly via the BBC State broadcasting corporation's radio and television media, inlcuding BBC Radio Five Live, Newsnight, News 24, BBC World and a few others. 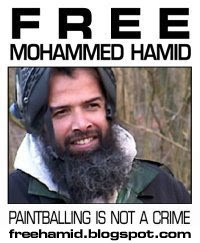 He is happy to wax lyrical at every opportunity about the official story of 7/7 and the repeatedly discredited Home Office narrative, the execution of Jean Charles de Menezes and 90 days internment, the latter of which he will advocate at great length as long as the targets for internment happen to be anyone that isn't a white-haired old lady from Tunbridge Wells. At last, after two and a half years, Peter Power has broken his silence about his 7/7 terror rehearsal activities which were, "based on simultaneous bombs going off precisely at the railway stations where it happened". You can watch the full We Are Change interview with Peter Power below. Quite an impressive response from the UK's Mr Terror Rentaquote, who usually has plenty to say about anything that is likely to increase the profits of private security firms like his very own Visor Consultants. 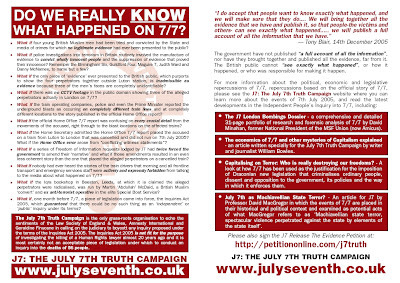 You can read a detailed compilation of information about Peter Power and his activities on, before and after 7th July 2005 here on the web site of J7: The July 7th Truth Campaign.